Unicoi Outfitters is happy to announce that we will be hosting a free seminar with Tony Narcisse on Kayak fishing. Tony operates a guide service on Lake Lanier, specializing in chasing stripers from kayaks...or as he puts it: "The Ultimate Sleigh Ride". Visit Tony's website to learn more about his services, and come out to our Blue Ridge store on October 10th at 1pm to learn more about kayak fishing - and remember, we always discount kayak accessories 20% with the purchase of a Native Watercraft Ultimate kayak. 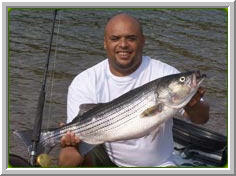 "I started fishing for stripers out of kayaks in 2006 and haven't looked back! There's nothing like the adrenaline rush of a big cow taking you for a sleigh ride." Since his first encouters with striped bass in small plastic boats those few years ago, Tony has pioneered a sport that has taken firm root in one of the nation's most respected striper fisheries. "Not only is Lake Lanier gorgeous, but she boast some of the best fishing in the country. And there is no better way to see/fish Lanier than by a kayak." As the Founder of Georgia Kayak Fishing club, Tony's pioneering spirit, warm personality and deep knowledge of Lake Lanier's striper fishery makes him the perfect guide for your Lake Lanier Adventure, and he'll be sharing some of that knowledge with us on October 10 - come join us!